Neighborly supports checking and savings accounts at US banks and financial institutions. We do not accept payments from checks or credit cards. You can add a payment method on the Connected Bank Accounts screen or from the dropdown menu in the top right of the screen. For some financial institutions, we are able to verify your bank account instantly. We use Plaid, the industry-standard in secure bank account authorization, to perform this instant verification. Plaid’s instant verification service supports more than 1500+ institutions. Please contact us if your institution is not supported, as we are working with Plaid to expand the range of institutions eligible for instant verification. 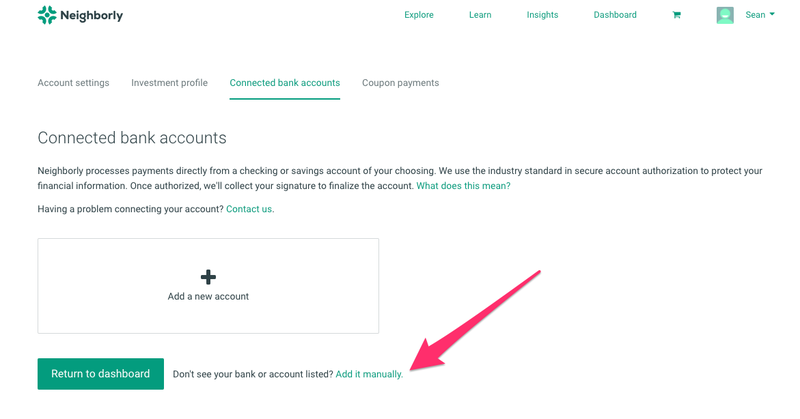 If your bank or financial institution is not in this list, you can still add a payment method from the Connected Bank Accounts screen. Choose “Continue” to open an ACH form. Fill out the fields requested. After you finish, then you will be directed to 'DocuSign'. Sign and submit the form. After your payment method has been added, click Return to Cart to review and submit your order.